Fires were a terrifying and real fact of life for Californians and San Ramon Valley pioneers. The long, dry summers and lack of water supply were an enormous challenge when fires started. Volunteers fought fires with gunny sacks soaked with creek water and put water in leather buckets to douse the flames. And, as with the Flournoy fire, they depended on the wind to change. In 1912 the Danville Improvement Club began the first local organization to fight fires. At a January meeting of men and women they decided to create the Danville Volunteer Fire Department. These officers were elected to lead the effort: Joe Adams Freitas, Fire Chief; George W. Groom, 1st Asst. Chief; Harvey Eddy, 2nd Asst. Chief; Clarence W. Close, Treas. ; and Ed C. Wiester, Sec. All of these men owned property in downtown Danville. Joe Freitas owned the Freitas Big Store (near the corner of Prospect and Hartz), Groom had a blacksmith shop on Prospect and Railroad, Harvey Eddy’s houses were at the corner of Church and Hartz, Clarence Close had a large house on Diablo Rd. and owned businesses on Front Street and Ed Wiester’s large warehouse sat north of the S.P. station. The organizing minutes of the Danville Department stated that “Its object shall be the preservation and protection of property from and during such fires as may occur in the village of Danville.” A Fireman’s Ball was held in March of 1912 which raised $169.20. After expenses, $100 was deposited in the San Ramon Valley Bank in downtown Danville. The District was supported by many volunteers, using a trailer with ten 10-gallon milk cans full of water and gunny sacks. The trailer was kept downtown and, when a fire occurred, the nearest volunteer with a trailer hitch would connect the trailer and get it to the fire. Ranches usually kept buckets, milk cans with water and early extinguishers on hand. In 1921 a state law enabled special fire districts to organize and levy a tax to support the districts. On Sept. 6, 1921, the Danville Volunteer Fire Department became the Danville Fire Protection District, headed by Commissioners James Jones, William A. Ward and Frank Rutherford who were appointed by the County Board of Supervisors. After boundary discussions with several San Ramon men, including Henry or Fred Wiedemann, Joe Bettencourt, Bill Meese and Elmer Baldwin, the first official boundaries became the Alamo, Danville, Sycamore and Green Valley Grammar School Districts, an area of about fifty square miles. In 1922 the District came into its own. On March 18, Ward, Jones and Freitas became the first elected Commissioners. At a May 20 “preparedness meeting” the commissioners appointed Oscar Olsson to be Fire Chief, R. J. Monroe Asst. Chief and H. M. Fitchenmueller Captain. On July 15, 17 firemen met and “Commissioner Jones, in a few well chosen words, presented each one with a badge of authority.” In April the department made its first investments. A Reo-American La France 45 chemical fire truck was purchased for $4,140 and was delivered shortly after. In July of 1925 the department brought a lot for a firehouse at 150 N. Hartz Ave. in Danville and paid $600 for the property. A San Francisco architect selected the building style and proposed its cost to be approximately $5000. The firehouse was completed and accepted on Dec. 2, 1925. These were the origins of official fire fighting in the valley. 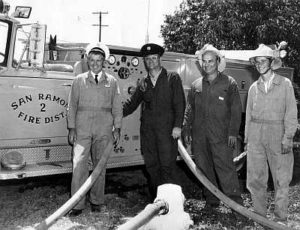 Other fire districts organized later: Valley Community Services District (1960), San Ramon (1963), Tassajara (1969) and Dougherty Regional (1988). By 1997 all of these districts were formally joined. Today a very modern San Ramon Valley Fire Protection District includes both professionals and volunteers, covers 155 square miles and provides fire prevention, fire fighting and emergency medical service.